NEW CPS Haze Hunter Exceptional cleaning power, get your screens like new again with CPS Haze Hunter, the latest screen haze remover product from CPS. Contact your local dealer to arrange a demonstration. We’re Greener Our aim is simple: To create the greenest printing solutions for the screen printing industry; without comprise to quality or your budget. The Community Come and join in with the lively discussions. Hear about local events, discover some amazing new tips, share your own and find new friends in the industry. So what are you waiting for? Come and join ‘Screen Printers of the World Unite’ created by printers for screen printers. William Shorter shares tips and insider information on Haze Removal, by taking a look at identification of different stains and ghost images and the best methods for their removal. Dip tanks, the screen reclaiming method of choice in the US, are attracting more interest in Europe. But why? You just soak your screens in the tank of chemicals and rinse; right? With the increasing interest in this screen reclaim technique, we are being asked more and more about this process. 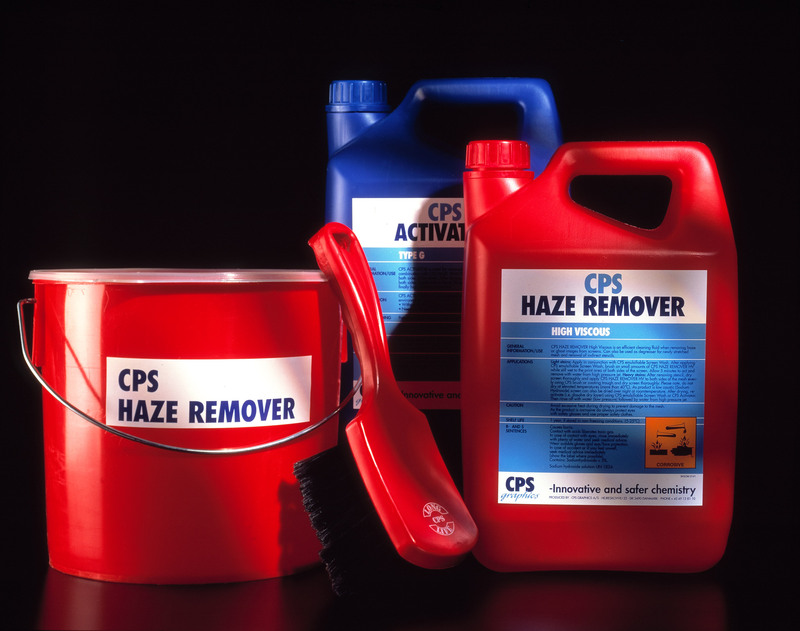 CPS has cleaning covered – with a complete range of screen haze removers and screen cleaners to suite all your needs. CPS screen preparation products have been designed to deliver consistently powerful and efficient results every time, and are suitable for cleaning by hand or by machine. The range has been created to work as a complete package ensuring that each step of the cleaning process is covered. Why not contact your local dealer for a free trial we’re sure you’ll be pleased with the results. CPS is a specialist manufacturer of safer and environmentally friendly screen printing chemicals supplied world wide. Founded in 1982, CPS are recognised as pioneers in safer chemical product development driven by a vision to provide a sustainable printing process that is safer, greener and more efficient for the print industry. Come and join in with the lively discussions. Hear about local events, discover some amazing new tips, share your own and find new friends in the industry. So what are you waiting for? Come and join ‘Screen Printers of the World Unite’ created by printers for screen printers. Do you want to learn more about screen printing or struggling with your screen making and screen cleaning processes? Check out our ‘How to Guides’ for great hints and tips that will improve your print process, while also helping you become more sustainable and green.